For reasons I will never be able to explain, I seized on Cindi Lightballoon. Arrested Development has no shortage of strange character names, and while a lot of them seem to be an in-joke or an allusion or a pun, some go unexplained. Your Gene Parmesans, your Jan Eaglemans, your Trisha Thoons just exist in the Bluthverse, sounding like they should mean something if only you could just make the connection. Of these, the one who bothered me most was Cindi Lightballoon, George Sr.’s prison girlfriend, who was played by Jane Lynch back before she herself was imprisoned on Glee. That last name just seemed like too awkward a combination of familiar words to not mean something to someone. Having finished Arrested’s fourth season, I still can’t tell what her name means, but now I’m thinking that the show maybe made a callback to it. In order to disguise her true identity when she’s trying to romance the politician Herman Love (“her man-love”? ), Lindsay gives the fake name Cindy Featherbottom. It’s a little mean, Sue Sylvester not withstanding, but I can’t let it go. I mean light : feather :: balloon : … bottom? No, wait, that doesn’t work at all. Damn. For the record, I tweeted the question at Chuck Martin, the Twitter-savvy of the two writers credited with this particular Arrested episode. He recommended I ask Mitch Hurwitz, who presumably has better things to do than answer niche fan questions and who has yet to respond. Regardless of anything, we can all agree that having Cindy the Ostrich walk the red carpet at the fourth season premiere is the best thing ever. 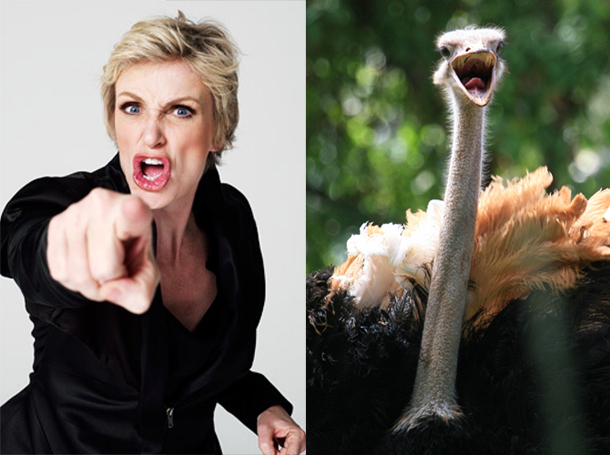 Read more: all things verbal, arrested development, jane lynch, names, ostrich, what do you do with a BA in english? Cyndi Lauper + 99 luftballoons = Cindy Lightballoon? This may be the connection I felt was there but couldn't make on its own. Sadly, there's nothing 80s music about the character... you know, except for Jane Lynch going onto that show that made people sing "Don't Stop Believing" more often. Ophelia Love = I'll feel your love? I just like Henry Winkler.